There is a video of the entire last lap of the Ghost before the crash which Matt showed me. As Leeward was coming around pylon #8 at about 480 mph after passing Rare Bear, he hit turbulence which pitched his left wing down, Leeward corrected with hard right rudder and aileron. Just as the aircraft was straightening out, he hit a second mountain of turbulence which caused the tail to ‘dig in’ resulting in a 10+ G climb rendering Leeward unconscious instantly and resulted in the tail wheel falling out. (broken tail wheel support structure was found on the course). As the Ghost shot upward the LH aileron trim tab broke loose. This can be heard on the tape, so the trim tab did not cause the accident. This is conclusion is diametrically opposed to the conclusion that I (and many others) reached, based on the information available—namely, that the failure of the trim tab caused the steep climb, not vice versa. As the email was forwarded to me by a trusted and experienced member of the aircraft community, I was surprised and concerned by its assertions. Matt has had long conversations with the NTSB who call the accident a ‘fluke’. They are not going to recommend canceling future races. He has also talked to the insurance companies covering the races for Reno and they also say they are not going to cancel their coverage of future races. Now we wait for the FAA to make a decision. The NTSB is highly secretive about their ongoing investigations, which are very serious matters with life-and-death consequences. They are a long way off from reaching a conclusion, and will not issue their report until next year. Only then will the FAA be in a position to change its rules. For one thing, though he was indeed enrolled in the Unlimited air race along with Jimmy Leeward, he sat out that particular heat due to mechanical difficulties, so he could not have witnessed Leeward’s difficulties from the air. Jackson says that he tried to track down who wrote the email, so far without success. I found this while searching for an online version of your essay “The Wright way to go”. I saw a photo and article a day or two after the crash that showed an empty cockpit immdiately before the aircraft hit the ground, and as the article noted, there was no seat nor pilot visible in the photo. It was suggested that the seat came loose in the steep climb, making it impossible for Mr Leeward to regain control of the aircraft. Your thoughts? (I am a meterologist, not a pilot). Hi Dave, I have no special insight into this question, but the general consensus seems to be that having suddenly pulled up into a 10g climb, Leeward almost certainly would have lost consciousness, so that even if he had been able to reach the controls would have been unable to do so. I imagine we’ll never know for sure. If you can find it, read Fly Low, Fly Fast by Robert Gandt. While the book is pretty uneven, it does have a pretty solid chapter on the Voodoo incident mentioned elsewhere. To sum up, in that race Hannah had loosened his straps and when the trim tab broke and the plane shot up, he lost consciousness and awoke finding himself face down on the floor of the plane. A similar thing could have happened with Leeward. It’s not possible to be “face down on the floor” of a P-51 – there is not enough room, and there is too much stuff in the way. The P-51 had two plywood floor-boards, but most fighters and light bombers of the era did not have a cockpit floor. If you dropped something, it would fall into the belly of the plane and could not be retrieved until you were on the ground where you could open a fuselage access panel. p.s., Be patient while the cockpit view loads – it’s very hi-rez (and in color) – but it is well worth the wait. Thanks, Robert. That is very cool. Wouldn’t it be awesome to be able to strap into a baby like that whenever you wanted! Once I was flying a 172 from Reid’s Hillview, San Jose, to Monterrey, and as I was crossing Salinas a P-51D passed less than a half-mile in front of me moving from my left to right. The P-51 was climbing hard – he looked to be going up faster than I was going horizontal. I live close to Moffett field right on the approach. When the war birds are in for Memorial Day I have two weeks of being buzzed by a B-17, B-24, B-25, P-51C, and (sometimes) P-51D. Early one Saturday morning I was treated to the sight of the P-51D (in Normandy invasion stripes) flying close formation with the B-17G making approach to Moffett. There’s something especially thrilling about catching sight of a warbird “in the wild.” I was cycling along the Hudson River here in NYC a few years back and nearly got whiplash when a B-17 flew up along the VFR corridor at 1000 feet. I had the privilege of being at EKY airport in Bessemer, Alabama in 2002 when Jack Roush flew in with Bud Anderson’s former “Old Crow” a day or so before his crash in another plane.. I had literally soloed a few days earlier and this joker flies in crosswind to the field at what seemed like 350kn.. then he lands, climbs out and asks everyone if they were expecting someone.. there was no media on hand, it was awesome. A great day to stare at a plane.. they are HUGE.. not at all what I expected. But I digress..
Another great, yet tragic article. There is video shot from the backstretch showing the initial climb part of the crash. 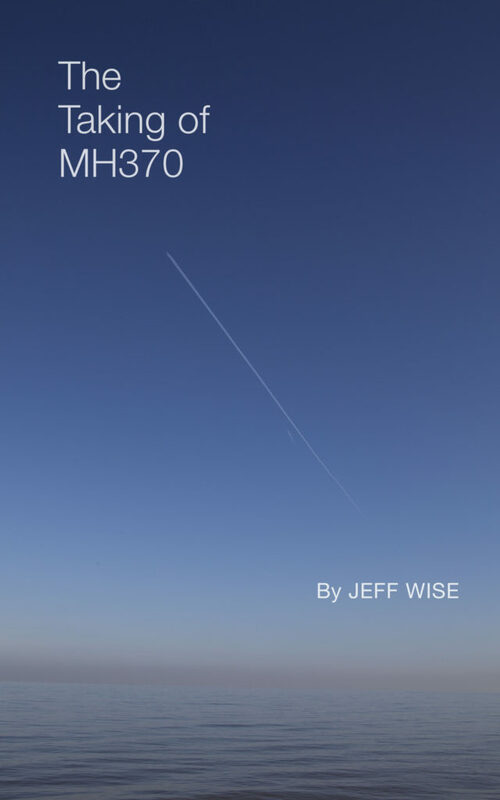 The Video shows a whole lap and begins with a different plane pitching up in the same spot, at initially the same angle you see in the crash. It’s perfectly commonplace for a race pilot who suddenly feels something to wrong to pitch the plane up as the very first reaction to trade speed for altitude in case they have to deadstick the landing. Explain to me why in a race plane that can be ballast weighted fore or aft, or should be able to any way, why there would be need for so much trim tab as to make loss of one catastrophic? The trim tabs are adjusted to minimize stick pressure at a particular speed. So, if you configured the plane in such a way that it could fly at 500 mph with neutral trim, then you’d need a ton of trim at landing/takeoff speeds. Generally, planes are designed the other way: neutral trim at takeoff. can someone shed some light theory of an high speed stall? I haven’t heard about that, could you elaborate? For the non-pilots: it’s important to know that balance and trim are separate issues. Weight and balance are of fundamental importance to the ability of an aircraft to fly. The weight cannot exceed the max allowable take-off weight (decreases with altitude and air temperature; most large aircraft also have max allowable landing weight). Balance is critical to aircraft pitch stability. The Center of Gravity, CG, has to be a bit forward of the Center of Lift, CL, of the wing. As the CG moves back to the CL the aircraft becomes pitch unstable, and the elevator control becomes very sensitive. In level flight a conventional, tail in back, aircraft flies with down-force on the horizontal stabilizer. This down-force creates a pitch-up torque to balance the pitch-down torque of the wing and gives the aircraft pitch stability. Large aircraft are required to have a Load Plan to assure that the CG is within limits. I recall that several years ago an Airbus taking-off from New Jersey (?) crashed because the Load Plan was not followed correctly – after rotation/lift-off the aircraft was pitch unstable, and the pilot could not control it. The purpose of trim is to zero-out control forces in straight and level flight. Small aircraft have cockpit adjustable elevator trim and fixed tabs for rudder and aileron trim. Larger aircraft have cockpit adjustable trim on all axes. With the aircraft in trim, the pilot seldom touches the controls while cruising. High-speed stall: Aerodynamic stall occurs when the wing exceeds its critical Angle Of Attack. It is very important to understand that the critical AOA is independent of air speed. When the critical AOA is exceeded, air flow separates from the wing upper surface, and most of the lift is lost. You first learn the deceleration stall: throttle off; gradually pull back on the elevator; stall at 1 g. Then you do the departure stall: full power; climbing turn; gradually pull back on the elevator; stall at 1+ g. Acceleration stall: power up; turn at 60 degree bank (2 g); pull hard on the elevator; stall at 2 g. These stalls happen at very different air speeds. In WW II pilots had to be trained to avoid high-speed stall when pulling out from diving attacks. Diving at over 400 MPH, pilot releases ordinance and abruptly yanks back on the stick. Aircraft abruptly pitches up, critical AOA is exceeded, and wing stalls. Instead of pulling out, the aircraft continues to plummet. Pilot has to push stick forward to reduce AOA to get air flowing over the wing and then make a smooth pullout. To your earlier comment – I would leap at a chance to fly a P-51. I have flown an SNJ (AT-6): 600 HP Pratt & Whitney Wasp radial (in this later version), burns 35 GPH. The controls are very light and powerful – it’s nice for maneuvers. The Hamilton constant speed prop does a great job of controlling the engine, which is a big help. Doing aerobatics in a Citabria/Decathlon you are constantly working the throttle. 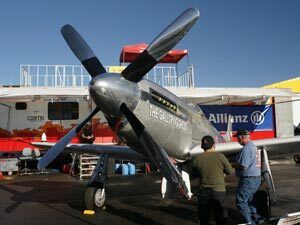 The P-51 and SNJ were both made by North American Aviation. The sound of those nine big cylinders firing-up is a big part of the fun. Here’s a pix of the SNJ and me. Hi, I’m not a Pilot but I have watched quite a few videos of The Galloping Ghost in the lead up to the Reno crash. However, in the final turn the plane seemed to be at max speed and strain making the corner when the pilot possibly hit turbulence or something mechanical broke because you can see the plane ‘wobble’ some and slip before being corrected by the pilot. As the pilot corrects the problem, it’s at this point the plane shoots upwards. It is then apparent that the trim tab is broken from the tail plane and is just hanging from it until it finally breaks off completely just before the apex of the climb. The plane then rolls over and crashes into the crowd. My query is what happened in that corner? There is a very clear and close shot video of that last corner. If the Trim tab broke free at the time of that “wobble” is it possible that caused the plane to shoot upwards so violently as the official investigation suggests? Is it also possible that something happened in the cockpit, as some suggest the back of the seat may have broken? Causing the pilot to lose control and then forcing extra strain on the trim tab causing it to break free? It’s a bit like the chicken and the egg in that the question I have is what incident caused what to happen first? Today I watched a vid on YouTube of this crash so my 2 cents. The first sign of trouble I see the left wing fall and nearly rolling inverted due to a high speed stall because the wing just moved out of the envelope. Leeward corrected the roll okay but also pulled up hard enough to break off the trim tab and leeward becoming unconscious. I’m not saying it’s so but like I said my 2 cents.